OFSTED Analysis of Attainment & Progress for Bishop Ellis Primary School over the last 3 Years 2016-2018. The attainment of pupils at Bishop Ellis School is consistently above national and the local authority both at the expected standard and at the higher standard. This means children do much better than most schools. 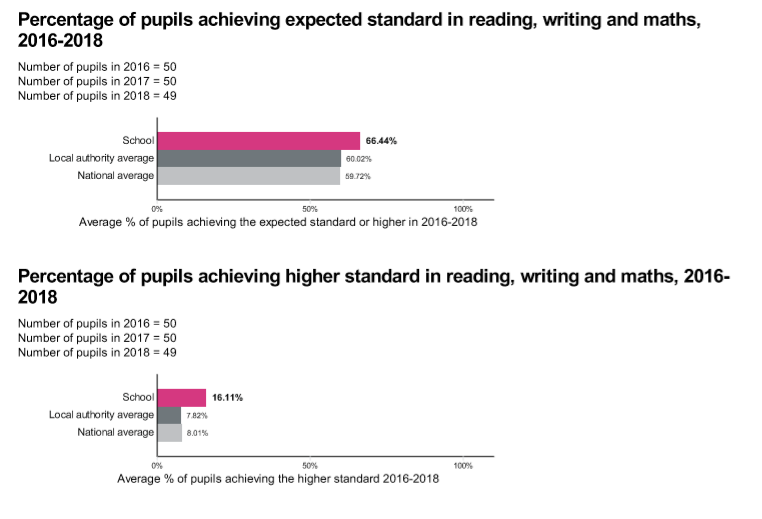 The first two tables show comparative percentages between the school, Leicestershire Local Authority and all schools nationally for attaining at the standard and above the standard for all three core subjects (reading, writing and maths). Pupils are given a scaled score for each subject based on their Y6 test outcomes which are marked externally. Pupils take tests in reading and maths, whereas writing is assessed by the teacher and moderated by the Local Authority. To attain the standard, pupils need to attain a scaled score of 100. 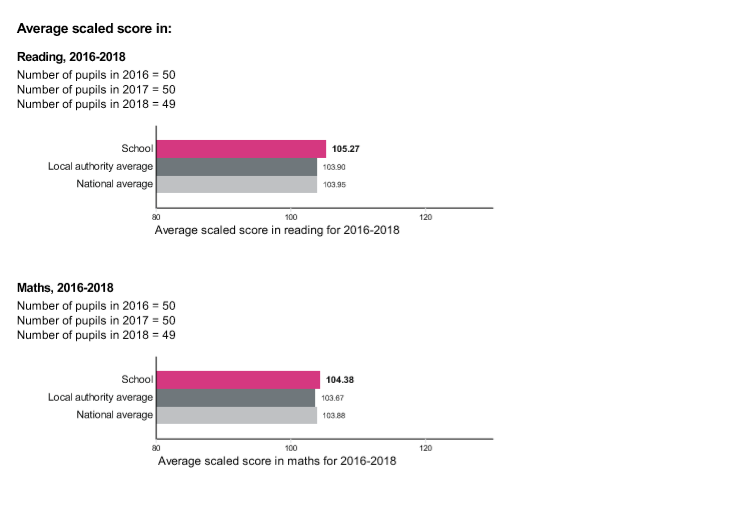 The school has attained above national and Leicestershire in reading and maths over the last 3 years as shown in the two tables below. Whilst attainment is important, schools are primarily judged on their progress. This is how children have attained from their starting points. Progress at Bishop Ellis Primary School is consistently strong with OFSTED analysis showing that the school is usually above national in all subjects and sometimes well above national. Details of our school performance can be found at the Government Website within this link. Compare Bishop Ellis outcomes with other schools locally and nationally. Click here to find out why we are rated as a 5 Star School by the Leicester Mercury. Click here to compare our school with other schools in Leicestershire. Congratulations again to all our Year 6 pupils who worked incredibly hard with fantastic attitudes over the year. *writing is teacher assessment as there is no test. The outcomes are once again above national for all subjects. Progress from starting points is again very high; the national progress indicator is zero. A high proportion of children achieved the higher standard in each subject again all exceeding national. Congratulations to all our Year 6 pupils who worked incredibly hard with fantastic attitudes over the year. *SPG: Spelling, Grammar & Punctuation. NAT- compares school with the national outcomes. 72% of pupils attained the new standard in reading, writing and maths compared to 53% at national. The percentage of pupils at the school attaining the new standard was above national in in all subjects. Reading: 12% above; SPG: 6% above; Writing: 10% above; Maths: 16%. The average scaled score for the tests was also above national for all subjects (see table above). Attainment at greater depth in writing was 36%. Teacher assessments for writing were fully validated by a formal visit from Leicestershire LA. Progress is well above national. Progress and results will be validated by the OFSTED data analysis documents which will be released in November 2016. 32% of pupils in Year 6 scored Level 5 (above average) in Maths, reading and writing (national was 24%). 98% of pupils made two levels of progress in English from Key Stage 1 (7% higher than the average nationally). 95% of pupils made two levels of progress in Maths from Key Stage 1 (6% higher than the average nationally). 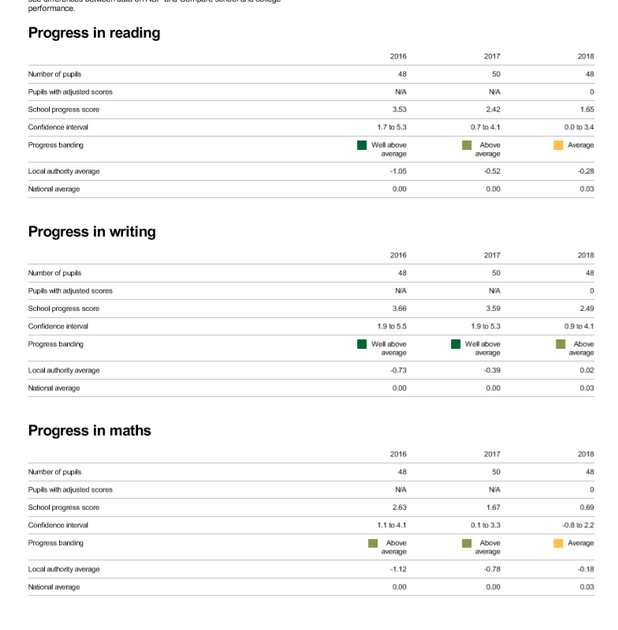 57% of pupils made three levels of progress (exceptional) in Maths from KS1. 57% of pupils made three levels of progress (exceptional) in Reading from KS1. 45% of pupils made three levels of progress (exceptional) in Writing from KS1.